Champion Urbosa’s Song is a new trial in Zelda Breath of The Wild. It’s a part of the second DLC named The Champions’ Ballad. All champions’ quests start near one of Divine Beasts by talking to Kass near monuments, where you’ll get a hint how and where to discover new secret shrines. Your goal is to complete three different challenges and discover and solve a shrine after each trial. On the monument you can see small images that show part of the maps you’re supposed to visit. It’s very tricky to find these locations, and in this guide we’ll help you solve Champion Urbosa’s challenges in Zelda BoTW Champions’ Ballad. In this desert you’ll face Molduking as part of Divine Beast Tamer’s Trial. The best way to defeat this beast is by throwing Remote bombs on his path, and once he jumps into the air, use Stasis to stop the time, then hit him with bomb arrows. Once you defeat the Molduking, Keive Tala Shrine will appear. In the first shrine, Keiva Tala will offer you Big or Small challenge in the name of Goddess Hylia. In this trial your task is to complete electrical circuits to power up various parts of the machinery. You need to use magnesis on metal cubes on the right and put them in the right place to the left. For the first metal cube you’re just supposed to put it in the water near the sparkling water. The second cube is used to complete the circuit that will lift up the platform, and then you should put the cube on the platform to complete another circuit. (you’ll see on the platform an active and inactive circuit – use the cube to connect these). This should electrify a large metal ball in the water to the right. Move the electrified ball over the metal bar, so it hangs over it and electrifies it. For the last switch, use freeze and put the metal cube on top of the newly created ice pillar. That will open the gate, and you’ll be rewarded with Naboris’ Emblem. The second riddle will take you near Gerudo town. The closest shrine to this destination is Daqo Chisay Shrine. In order to solve this trial, you’ll have to catch a sand seal, and then race down through blue glowing rings in the sand. It’s not easy to catch a sand seal, but you can always shoot a bomb arrow. It will make them dizzy, and easy to grab. Just follow the blue rings in the sand, and avoid hitting the lizards and other obstacles. Once you successfully finish the race, Takama Shiri Shrine will appear. Takama Shiri offers the second trial named Dual Purpose. If you have Thunder Helm just put it on and it will deflect lighting strikes. If you don’t have it, you’ll have to move the blocks, to create a path where you can go (blocks are not affected by lighting), then, when you reach another platform, create electrical pathway to open the gate. The third room is a little tricky. Once you reach the upper platform, create the electrical pathway, then move one block from the uppermost row to climb up onto the gate platform, then simply move the block back. In order to solve this rhyme, you should see a huge hole on the left side of the image. There is only one place with a huge hole and that is Yiga Clan Hideout. Don’t start this journey without Stealth Mask, Stealth Chest Guard and Stealth Tights. Once inside the Hideout, you’ll have to reach the ladders that lead to the first floor, and steal the orb. You should throw the orb into a huge hole, and the Kihiro Moh Shrine will emerge from the ground. The third trial is named Inside the box. As you can see there are 10 holes on each side. There are boxes in the walls with pink, green, yellow and blue orbs inside. Your task is to put 4 orbs on the ground into the holes, but the colors have to match. Put the pink orb in the first hole, green one in the second hole. Yellow orb in the third hole and the blue one in the fourth hole. 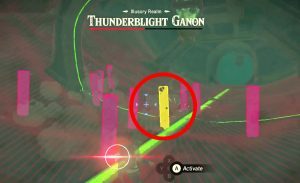 There are a few tricks to use in order to kill Thunderblight Ganon in the Illusory Realm. You’ll be fighting with Urbosa’s gear, including the Sword of the Seven and the Daybreaker shield. This version of Ganon fires green orbs of lightning which shock you on impact, causing you to drop your weapons. Also, it can zip across the level and close distances really quickly. You’ll have to be on your toes. At the start of the fight, we recommend to let Thunderblight Ganon come to you. We recommend that you take the battle to the bottom level, just to have a bit more space. Dodge the green lightning orbs. Jump out of the way when Ganon comes at you. When his attack is done, quickly engage into melee. We recommend using Daruk’s Champion ability to provide some protection for yourself. Hit Ganon a few times to break the shield, then keep wailing on him until he falls over. If you have the chance, use Flurry Rush to bypass Ganon’s shield altogether. In case you wanna add a few more hits, you can Stasis Thunderblight while he’s on the ground and beat on him some more. Repeat the sequence until you bring Thunderblight Ganon down to half health and start phase two. In phase two, Thunderblight Ganon will take to the air, meaning, you have to knock him down. Fortunately, it will rain metal spikes. Be careful not to get hit by one. Use Magnesis to pick up one of the spikes, raise it as far up as you can, and drop it on Ganon to bring him to the ground. Quickly run to him, use Stasis, and wail on him as much as you can. Repeat as necessary. When you bring him down to below a quarter or so, instead of the sword, use Urbosa’s Rage to finish Thunderblight Ganon off. If that doesn’t kill him, it’ll still do a ton of damage, making him easy prey. Defeating Thunderblight Ganon is but one step in the journey to unlocking the ultimate prize of the Zelda BOTW Champions’ Ballad DLC. We hope our guide helped you out, but, the perilous journey is still ahead. It’s difficult, sure, but it’s also a blast to beat Ganon again and learn more about the world of Breath of the Wild. If you need more help on your quest, please feel free to check out our other guides, such as Champion Revali’s Song, Champion Daruk’s Song, and more. Thanks for the guide! However, the pictures for “Fight the brute of the sand” and “Chase rings upon the land” are incorrectly swapped. One small suggestion, though. Fighting the sand beast is much easier if you use shock arrows instead of bomb arrows. The electricity does a LOT more damage than the bombs. I even found that using Urbosa’s fury delt a ton of damage.